Bwin, as it exists today, is the result of several corporate deals. First, in 2011 Bwin merged with PartyGaming to form Bwin Party. GVC Holdings then bought the business in 2016. Throughout, however, Bwin has continued to be the main sports book platform with customers of smaller operations migrated onto it. It has been known for several high-profile sponsorship deals, e.g. it was the main shirt sponsor of Real Madrid for a number of years (perhaps why UK punters will be familiar with the name, despite it being a predominantly European brand historically), but the value of these appears to have been in question and new management have cut back. 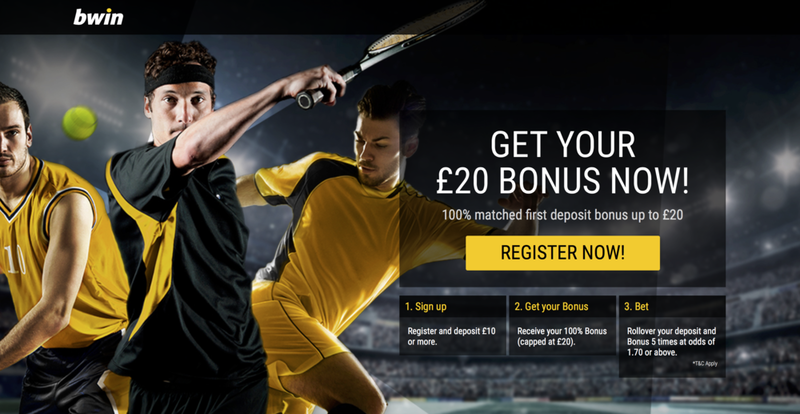 Bwin's bonus is structured as a deposit bonus rather than a free bet and you will need to wager 5x the deposit and bonus (£200 at maximum) before it can be withdrawn. This is a pretty stringent requirement on a low bonus, so you really going to want to lose, and lose quickly, at Bwin. Use high odds to avoid the bet through requirement. The bonus will only be granted to persons who are registering for the first time at bwin. Get an extra 100% up to 20 GBP on your deposit amount as a bonus. The bonus will be credited based on your first deposit after the account creation; this deposit has to be made within the next 30 days after the account creation. To receive your bonus, deposit using one of the following deposit methods: INSTANTBANKING, VISA, DINERS, MAESTRO, MASTERCARD, QIWI, BANKTRANSFER, WIRE, EWIRE, PAYPAL, INSTANTBANK. Bonus type: Withdrawal restricted. Bonus funds are available to play with, but cannot be withdrawn until the requirements are met. Your bonus, deposit and winnings will be displayed as Restricted Amount and will be visible in the bonus section of your bwin account and within the bwin Sports product until the requirements of your bonus have been met. The requirements of your bonus can only be met when playing on Sports. The bonus, deposit and winnings can only be played in these categories until the requirements are met. Unrestricted after wagering 5 times the bonus and deposit amount. Time to un-restrict bonus: 90 days. Amount lost if bonus not unrestricted in time: Bonus and winnings amount. Offer can be claimed until: 01/01/2100 05:59 AM CET.